The pharmaceutical industry is a traditional customer for Medaffcon. Medaffcon was established in 2009 to serve precisely the needs of the pharmaceutical industry. The company’s ability to provide top expertise in Medicine and Health Economics under the same roof soon turned out to be an unbeatable strength. 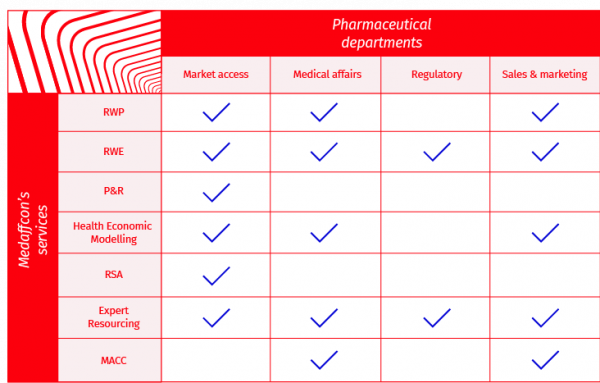 Our experts’ extensive background in the pharmaceutical industry (a total of more than 300 working years in pharmaceutical and medtech companies). Hundreds of successful projects with customers in the pharmaceutical industry (more than 400 completed projects since 2009). Wide-ranging knowledge basis in different positions in industry, research and healthcare. The ability to approach customer’s challenges from several different directions, bringing new perspectives – in a quick, flexible and tailor-made manner for the customer. Long-term cooperation with biobanks and other register holders, as well as solid expertise in biostatistics. Read more about our service supply and contact us.